I blogged here that in Nuri Bilge Ceylan’s 2002 film Distant “Ceylan represents the different visual experiences of the two protagonists.. something I've never seen done so deliberately and effectively.” Actually in Wayne Wang’s Chinese Box from 1997, co-written by Wang, Jean-Claude Carrière, and Paul Theroux, Ruben Blades plays a photographer working in Hong Kong who facilitates similar Point of View shots. As I said, much of Distant is the contrast between the two cousins’ POVs, making for a much more effective rendering. Fifth on the last decade’s list might have been too low, though Distant is a spare, low-key film, while 2014’s Winter Sleep, featuring Cappadocian landscapes, the charisma of lead Haluk Bilginer, and dense subplots lifted from Dostoevsky’s The Idiot and Crime and Punishment, had camped out at second on my current decade’s list, behind only that most original script about reproductions by Abbas Kiarostami - Certified Copy - also set in the provinces wherein Jean-Claude Carrière dispenses romantic advice to William Shimmell in a cameo. Carrière said when he first met Buñuel he told him he made wine, to which Buñuel replied “I can work with you then - you’re a provincial.” It took me a day or two to decide I liked The Wild Pear Tree (at Film Forum til February 12) better than Winter Sleep, as it proffers less plot development and more introspection. 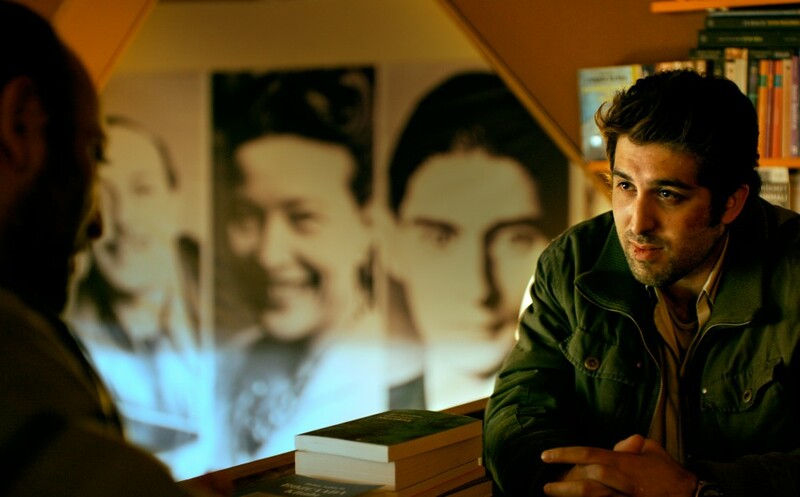 The Wild Pear Tree joins that pantheon of films about writers, which I’ve also blogged about - sharing the struggling West Asian scribe saga with the classic literary adaptation The World of Apu, though not working its way into romance. Films about writers can be placed into categories, in which Tarkovsky (Stalker), Godard (Contempt), Antonioni (La Notte), Welles (The Lady from Shanghai), and Potter (The Singing Detective) project themselves into the writer, the autobiography (Christ Stopped at Eboli), historical depictions of writers (Brecht in The Farewell, Wojazek, Hans Jæger in Edvard Munch, Sor Juana in I, the Worst of All). In The Wild Pear Tree, Ceylan got to know the son of a relative, Akın Atsu, who lived in the coastal city of Çanakkale, near ancient Troy, eventually reading his undiscovered short stories and liking especially “The Wild Pear’s Solitude,” and decided to make a movie of his life co-written by Atsu and Ceylan’s wife Ebru, resulting in a script gracefully containing the push and pull between Atsu’s reflections and the Ceylans’ commentary on them. Ceylan wrote “People who feel different in an intrinsic yet socially unacceptable way see their willpower pushed to its moral limits. Such people struggle to make sense of the contradictions inherent in their alienated existence, and vacillate between the limitations of addressing these contradictions creatively and the impossibility of rejecting them. They perceive their difference as a crime that must be kept secret, as a disease, and carry it like a hump on their back throughout their lives.” One of the structural differences between the Bildungsroman and the Künstlerroman is the ending, and here there is an alternate ending provided by way of a vision preceding the realist ending. The symbolism of corporeal imagery attempted in Once Upon a Time in Anatolia is more successfully rendered here, including the central image of a baby covered with ants to go with several premonitions of death and the wind blowing a young woman’s hair. Halldor Laxness’ World Light utilizes an actual provincial poet Magnusson “to isolate the pure artistic impulse in Romanticism and set it into the world below, which Magnusson’s subject matter, life story, and absence of irony befit,” providing a stable anchor for the instability of the narrator, but The Wild Pear Tree is destabilized by the protagonist’s role in writing the script. Variety’s coverage of a Ceylan Q&A in Sarajevo unspecifically cites questions about the “perceived political symbolism of his work.” There are two ostensively political scenes I can recall: one in which he talks on a cell phone to a conscripted soldier who reports his duties suppressing communists, not mentioning Kurds; and begging the frank, receptive mayor for funding. The second scene may emanate from Ceylan himself, who not only receives funding from Turkey but had this film entered by the government for a foreign language Oscar, for which it was ludicrously denied. The mayor in the film says he has funding for tourist books but not memoirs, echoing a theme from Distant where the photographer eschews landscapes and the hotelier writing the history of Turkish theater in Winter Sleep. Of this Ceylon says “People think that when you get money from the government, you are not free anymore. That’s not true. They give the money, but they don’t say even one word to you about how the film should be. They would have to discuss the film with you, and nobody knows anything about cinema. It doesn’t affect your independence in any way.” Except that there is no mention of Erdogan and related topics, while the novelist Orhan Pamuk earnestly offers insights into the mindset of the current President’s electoral base. My speculation here is that Ceylan is depicting the political ambivalence of Atsu, which Atsu signs off on as co-screenwriter, moving from Winter Sleep's realism of Dostoevsky into formalism. Eagleton pins on Flaubert the moment when “history is already an inert object” after 1848, “splintering” realism into Zola’s objective naturalism and subjective formalism, where “man is stripped of his history and has no reality beyond the self; character is dissolved into mental states...” out of which he attributes to Pierre Macherey the position “a work is tied to ideology not so much by what it says as by what it does not say. It is in the significant silences of a text, in its gaps and absences, that the presence of ideology can be most positively felt." The contemporary city of Çanakkale displays for tourists the wooden Trojan horse built for the Hollywood movie Troy, a relic from history used in one scene by the protagonist as a hiding place, amidst what reads as a portrait of the perceived futility of the Erdogan generation. Cinematographer Gökhan Tiryaki makes use of helicopters, hilltop POVs, coastal and rural scenery to make for a lively theater projection in which, even if it isn’t quite as picturesque as his shots of Cappadocia in Winter Sleep, the tension between the beauty in nature and the torment of the soul is more raw here.